Not much of a fan of the first one, I didn’t expect much from Far Cry 2. The headlines say otherwise. I checked out the aggregate score on MetaCritic and chuckled at the similarity between the two PC Gamer magazines across the pond. I bought Age of Conan a little after its release in May of this� year,� but chose not to resubscribe because it was too bug-riddled to suspend my disbelief and lose me in the world.� I decided a couple of weeks ago to give it another go.� Things are almost perfectly stable now, though there are still some attributes and player professions that are unfinished (unstarted, perhaps) and have no effect.� The positives far outweigh the negatives and I’m having a pretty good time drinking in the sights and soundtrack. The first improvement I noticed when I logged on for the first time in four months was that most of the help text and tooltips had been rewritten, for the better.� Many previously cryptically-described skills became clear to me for the first time, and that was really necessary for me to grasp the finer depth of this game. As something (but not much) of a technical writer, one thing bothered me about the description of my necromancer Arecibo’s Frost Blast spell.� See if you can guess what it is. When I began my co-op for my technical writing post-grad I was working on manuals for IT contractors.� � A domain administrator was my occasional SME, and he once challenged me on an odd gender-neutral pronoun I’d pulled out of my posterior.� “Themself”.� Embarrassing, I know. “Them is plural and self is singular.� That’s not a word,” he told me.� I felt sheepish; linguistically emasculated by a techie. It took me a little while to remember this which explained the twinge I felt in my heart as I silently cursed the dummy who chose the pronoun them in place of “The necromancer”. So what’s the correct gender-neutral pronoun? Seems a glaring omission. P.s., I’m such an English dork.� This isn’t the first time I’ve blogged about technical writing in video games. P.p.s., Worst.� Blog entry title.� Ever. P.p.p.s., You win a prize if you can guess why I picked my character name, Arecibo. Post your guess in the comments below. I read tonight on the CBC website that the Canadian Oxford Dictionary laid off its entire staff – of four – due to lack of sales. The nationwide sales of our dictionary weren’t enough to pay two full timers and two part timers.� That’s pretty sad. 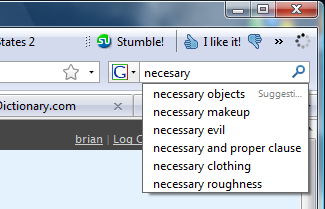 I bought a pocket dictionary in college but have relied on Word and dictionary.com whenever I had questions of spelling or etymology.� I confess that, in a pinch, I’ll even use Google Suggest in my Firefox 3 search bar. It’s a real shame to think these 4 people couldn’t be reallocated to an online service.� Canadian English is unique.